The shamrocks that dangle from these costume jewelry hoop earrings measure 3/4" wide and feature green enamel accenting. The 1" diameter hoops feature hypo-allergenic posts and are enhanced with green plastic beads. 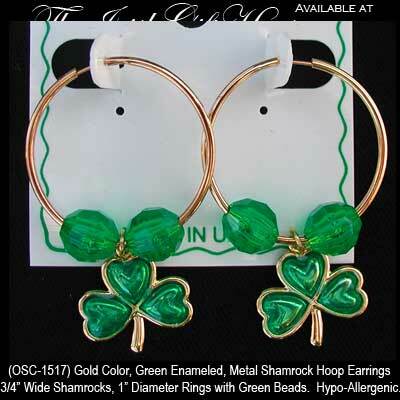 The Irish costume earrings are made in the United States and are received with a shamrock history card, complements of The Irish Gift House.